Single level living homes are hard to find, especially those that are not in a restricted adult community. Well get ready to head to an Open House this Sunday in Potomac Shores in Dumfries Virginia. This will be your chance to get inside and walk a luxury single level living home located on a quiet street in a golf course community in Prince William County Virginia called Potomac Shores. Potomac Shores Single Level Living Home for sale now. This is the only Chamberlin for sale in the neighborhood! Another thing that makes this particular home special is the lot. It backs to trees and fronts to trees. The home has many after purchase custom features that the owner added. 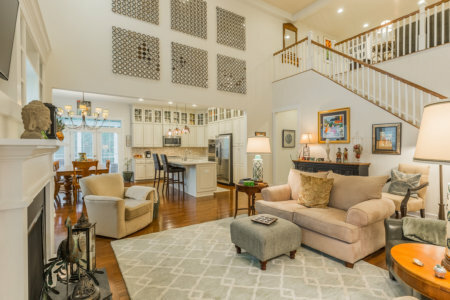 These include a huge screened rear porch with skylights and ceiling fan, a large deck for grilling, custom bookcase surround around the warm gas fireplace in the Great Room. The owner added an in-ground sprinkler system, replace many light fixtures, painted the master bedroom and bath and added several custom organization features to the home. Now living in the Chamberlin is truly a gift you give yourself. I have the pleasure of owning a Chamberlin as well and it is by far the easiest home to live in. 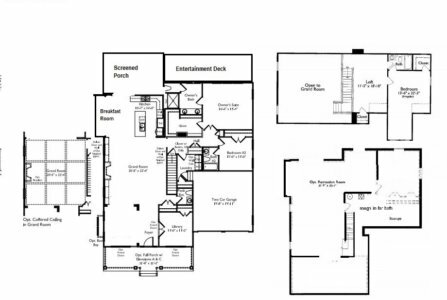 The entertaining possibilities are endless due to the open concept on the main and lower level. Wait til you see it. This home is an energy star home offering low utility bills. This is due to energy efficient appliances, lighting, HVAC system and siding. This home is sided with James Hardiplank Siding and has interior sprinkler system on all three levels as well as an inground sprinkler for the landscape. All of these things help lower the utility costs as well as homeowner insurance costs! My personal 4800 square foot Chamberlin averages less than $250 a month for utilities. Compare that to your older home that you have fallen out of love with. Maybe you were suppose to read this post today and just maybe you need to plan to take a drive to 17041 Silver Arrow Drive, Dumfries Virginia 22026 this Sunday March 24th from 1 pm to 3 pm. If you cannot make it that day, simple call us for a Private Tour. My identical twin sister and I both live in Potomac Shores in single level living homes. We know the community and floor plans better than most. Here is a photo that may motivate you. This is the heart of the home. I like to call it a “Bungalow on Steroids!” The home looks charming and unassuming on the outside and then the minute you step in the door you see the twenty foot high coffered ceilings and you just are drawn into the center of this open concept dream home. It only gets better from here. Hope to see you on Sunday. Ask any question you like…..